Thomas Cook Holiday Illness Complaint? If your holiday was spoilt by illness, and you suspect that food poisoning or poor hygiene was the cause of your symptoms, you can claim compensation from Thomas Cook. Going it alone – will you be compensated fairly? What is my Thomas Cook salmonella illness complaint worth? How do Thomas Cook Handle Illness Complaints? If you approach Thomas Cook’s legal team directly they will often avoid admitting responsibility for illnesses experienced abroad, particularly if nobody else has made a complaint. Over a 6 month period you will be told that a thorough investigation has taken place and that no problems with the hotel have been identified. In reality they have reviewed their in-house computer system for a number of standard paragraphs to drop into a letter, using delay to frustrate you. If there is a serious illness outbreak at a hotel then pro-active damage limitation occurs and the tour operator’s staff will be on the telephone offering ill holidaymakers compensation, normally in the form of pitiful holiday voucher or a low value cash offer. Phone calls from Thomas Cook’s ‘Welfare Team’ will occur shortly after your flight lands when you are at your most vulnerable. You may still be ill and at your lowest ebb simply wanting to put your nightmare holiday behind you. If you have an illness complaint, we advise all holidaymakers to take advice from a specialist holiday complaints lawyer, otherwise your tour operator may take advantage of your lack of legal skill and knowledge and under compensate you. Travellers’ diarrhoea is commonly experienced by holidaymakers, but contrary to the belief of Thomas Cook’s Representatives, change in climate, dehydration, viruses, heat etc. are unlikely to be the cause of an illness lasting more than 48 hours. The most common cause of travellers’ diarrhoea is bacteria including salmonella, E.coli, and shigella food poisoning. Our personal injury lawyers are readily available to advise you as to the value of your holiday illness claim. 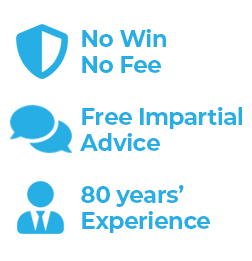 We have access to current case law and the JC guidelines on valuations, and this advice can be obtained on a no win no fee basis. If you have a valid complaint, Thomas Cook is liable pursuant to Regulation 15 of the Package Travel Regulations for the 'improper performance of the contract'. Holidaymakers should not be exposed to illness though contaminated food or poor hygiene. Being diagnosed with bacterial food-borne infection whilst on a Thomas Cook holiday is indicative of genuine complaint which deserves compensation. Thomas Cook holidaymakers who suffer from classic symptoms of food poisoning can contact our holiday illness complaints team for free initial advice and an assessment of your claim. Our friendly travel lawyers have years of experience in handling personal injury claims against Thomas Cook.